McDonald Murholme has prepared a how-to guide to navigate possible causes of action under the Fair Work Act 2009 (Cth) where your employment has been terminated, if you have been forced or coerced into resigning your employment or if you are being adversely treated in employment. You may make either an unfair dismissal application or a general protections application. The Fair Work Ombudsman (FWO) is an independent government body. It is concerned with the enforcement of the Fair Work Act and educating people about the Fair Work Act. What does the Fair Work Ombudsman do? 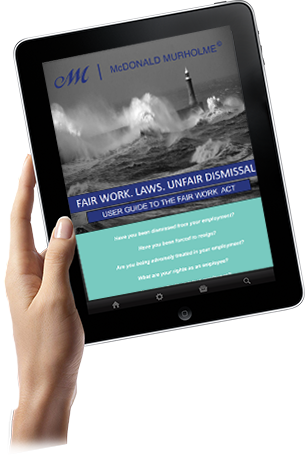 The Fair Work Ombudsman provides information (not legal advice) for both employees and employers about workplace laws. The Fair Work Ombudsman can choose to engage Inspectors to investigate when claims are very serious, the issue is widespread and/or the people affected are vulnerable. The FWO cannot force employers or employees to take any specific action, including paying money or engaging in mediation or negotiations. Only a court can make binding orders. The Fair Work Ombudsman collects unpaid wages for employees that are found in the process of an investigation or a campaign audit. Investigate unfair dismissal and unlawful termination applications. Make changes to the legislation, awards or registered agreements. Investigate bullying and harassment complaints. McDonald Murholme is the leading employment law firm for employees based in Victoria, Australia. By representing employees in their claims at the Fair Work Commission, we help maximise their case outcome through the provision of sound & professional legal advice.